In this edition of ‘In the Spotlight,’ let’s talk with Margaret Galloway. Margaret has been enrolled in my individualized programming option for 8-months now and I cannot be more impressed with her progress. Just recently we completed a re-evaluation/testing to gauge progress and determine the best next step for her program. Well… she blew it out of the water! When I think about Margaret, what comes to mind is consistency and patience. Some movements which include single leg balance and stability were challenging at first. But, Margaret realized this meant she had to focus more and work on them regularly to get the results she wanted. And that’s exactly what she did. Just a few months back, Margaret fractured her elbow. For most this would’ve completely stopped any progress while things healed. Instead, Margaret decided to work on the elbow with PT while continuing to use strength training on her unaffected side, core, and lower body. There were plenty of excuses to be made but we were able to create a program that was mindful of the elbow while still targeting the key areas which would move her closer to her goals. Here we are 8-months later with great progress due to her consistency and determination. With that being said, I am very excited to see how she finishes the year!! Q: What are the top reasons you enjoy running and being active? Q: What is your favorite part about the Individualized Exercise Programming option that you are enrolled in? Thank you for reading this ‘In the Spotlight’ segment. And, a big shout out to Margaret Galloway! Please feel free to comment below with any questions or feedback. In many cases, building strength becomes the main focus for runners since it’s been taught as a performance boosting and injury preventing strategy for years. Did you know that we actually lose power much sooner than strength as we age? And, that isn’t even taking into consideration the detriment of slow, long distance training on power production. What I’m trying to get at is that runners are commonly less powerful than other athletes. This happens as a result of the aging process, as well as the demands of the sport. But, that doesn’t mean you have to accept this as your reality. Improving power can be quite easy when you have a solid base of strength, stability, and function. All you need is guidance on which exercises are not only safe, but effective. Do you want faster race times? Do you need more kick on the uphill sections? Would less fatigue throughout your runs improve your performance? If you answered yes to any of these questions I recommend you watch the video in it’s entirety. When performed with good form, explosiveness, and consistency, it won’t be longer than 4-6 weeks before you notice a difference. A few key points to reinforce from the video is that it’s not necessarily the exercise itself but how it is performed that makes the difference. With power training, the goal is to quickly absorb energy on the landing and immediately recoil back into the air. Minimizing the time to transition from landing to the subsequent jump is what will provide GREAT results. And, as opposed to strength training, the repetitions with power development should be kept low to prevent high levels of fatigue that limit explosiveness. Plan for 2-4 sets of 3-6 jumps for proper programming. Plyometric training is essential for distance runners. The human body is extremely efficient in responding to the stress placed upon it. By training only with long and slow distance runs, the body becomes exactly that, slow. Therefore, it is important to reverse these changes and improve explosiveness by implementing some type of plyometric or power-based training within your program. Plyometrics are a type of training which consists of three phases. The eccentric phase is when the muscle is preloaded or lengthened as you come into contact with the ground. The amortization phase, or transition phase, is the time between lengthening and shortening. And lastly, the concentric phase is where the acceleration and explosive movement takes place. By adding a quick eccentric pre-stretch to the muscle, we are allowing the storing of potential energy and use of muscle spindles, which provide a subsequent greater force production during contraction, this is called the stretch-shortening cycle (SSC). It is essential to keep the transition time to a minimum, which means that as soon as you land and lengthen, you should already be applying force into the ground to take off. The concentric phase is dependent on the previous two phases. If we take too long landing and transitioning, we will not engage the muscle spindles to the fullest extent and therefore will not create a rapid contraction. This is the main reason I always spend time working on proper landing mechanics. Many people fail to realize that if you don’t land properly while under control, you can’t speed up effectively. Note: If you do not have access to a box you can use a step or curb. Below are several basic plyometric exercises that can be incorporated into your warm-up routine. Begin by perfecting the soft, controlled landings before progressing on to the faster drills. You don’t need to do a lot of quantity to improve in this area. But, you always have to focus on the key points, which are: soft landings, good lower body alignment, and a quick explosive movement on the repetitive movements. I recommend adding these into your routine 2-3x per week and starting with 2-3 sets of 8 repetitions, then adding 2 reps each week. Once you complete each level for 3-4 weeks, move on to the next level. If you feel you have not fully perfected the exercise there is no shame in spending additional time getting it down. About the Author: Garrett McLaughlin is an Athletic Trainer and Personal Trainer who works with youth and recreational athletes. His plyometric programs focus on perfecting the basic movement patterns, which ultimately increase overall athleticism, power, and performance. For more information on plyometric training, contact Garrett. Speed and agility is a mix of several different movement skills. Training just to be fast is a simplistic way to improve, but there are more components, that when broken down, will allow the athlete to reach a greater potential. When looking at speed and agility, it’s essential to break it down into more specific skills, such as: deceleration/stabilization, acceleration/explosiveness, change of direction (COD), and reaction training. In the previous post, Speed and Agility Training for the Tennis Athlete: Part 1, the deceleration/stabilization component was discussed in detail, with several drills to improve these skills. Now that we have taught the body to decelerate, properly stabilize, and provide a solid base in which to create movement, we can speed up the movement and develop acceleration, explosiveness, and change of direction. With the multidirectional demands of tennis, it is important to train in all movement planes for the best carryover to on-court situations. As we shift our focus and increase the speed of movement, many of the same line drills can be beneficial. Instead of slowing down each landing and focusing on control, we speed up as our goal is to minimize ground contact time. In regards to plyometric training, the time it takes to come in contact with the ground, control our bodyweight, and then accelerate off the ground is called the amortization phase. The fastest and most agile tennis players have taught their body’s to minimize this phase to as short as possible, leading to more explosive movement. In the following line hop drills, shift your focus to quick ground contacts with a rapid change of direction. Next, we build upon the line drills and begin training exaggerated movements. Lateral jumps are a great explosive lateral agility exercise. First, learn the movement by sticking the landing. Then, when you feel comfortable getting more distance and pushing off explosively, speed up the movement with the same goal as the line hops, minimize ground contact time. The faster you can change directions, the quicker you will be able to set up for the next shot, with enough time to get your body in the proper position. Lastly, in order to cover the entire tennis court we must again increase the distance traveled. With the court being a relatively small area compared to most other sports, we don’t necessarily need to run long distances, but train the body to move quickly for a short period of time in one direction and then rapidly change directions. The following drills focus on the basics of linear/lateral acceleration and change of direction. As you try these new drills remember it is better to focus on quality of movement over quantity. I recommend taking 4-6 weeks to perfect these skills. Oftentimes in sports training we want to do the hardest exercise or drill thinking it is the best for us. But, proper progression will not only improve the motor pattern more efficiently, but allow for the most carryover to practice and match situations. In the next article we will focus on tennis-specific change of direction and reaction drills since each point in tennis is unpredictable, which requires anticipation and quick reaction. ***Note: If you are unsure how many sets and repetitions to complete of each of these movements, here is a sample breakdown to provide structure for the progression: Part 2 Speed & Agility Progression. 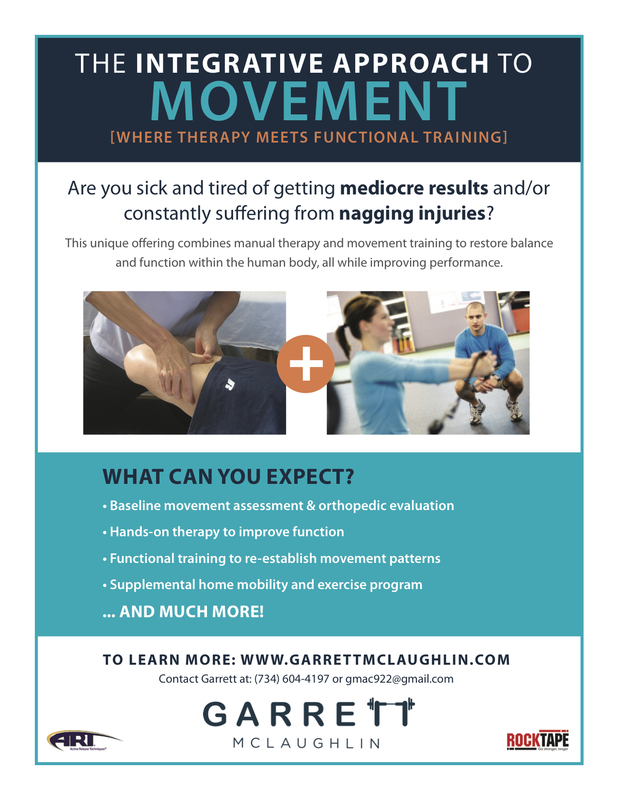 Garrett McLaughlin is an Athletic Trainer and Strength Coach who works with young tennis players to improve movement quality, speed, agility, strength, and power. For more questions on strength & conditioning for the junior tennis player, contact Garrett.